Two books similar to this one on how to put together a business plan are: "16 Weeks to Your Dream Business" (ISBN: 9780071588362, and "Self Employment: From Dream to Reality" (ISBN: 1563709228). And a book similar to this one on how to put together a fundraising plan is: "The Fundraising Planner" (ISBN: 0787944351). The instant book being reviewed touches on the marketing issues of social media, and then devises a systematic approach to putting together a social media marketing plan customized to your small business. Each of the 14 chapters ended with a summary section. I found it very easy to cruise through this book by first reading the summary sections and then tackling the rest of the book after having a pretty good idea of what was being covered. After reading this book you will have devised a social media marketing plan that addresses (1) platform, (2) content, and (3) interaction. You will have decided whether to use Technorati, MySpace, Socialvibe, Flickr, Facebook, Friendster, Linkedin, and/or YouTube. Technorati is the tunnel through which to learn more about the blog or blogs you will create. 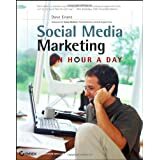 So if you want to tap into the power of the Social Web through connected networks and consumer-oriented media, then I recommend this book as one of the tomes you seek out and read in order to build your company's social media marketing plan. 5 stars! Want to learn more information about Social Media Marketing: An Hour a Day?